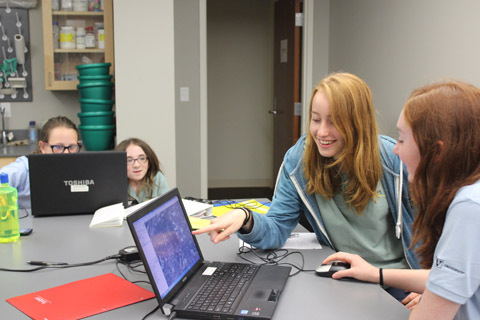 Bioimages and the School For Science and Math at Vanderbilt (SSMV) are the recipients of a 2014-15 Creative Campus Innovation Grant funded by The Curb Center for Art, Enterprise and Public Policy. 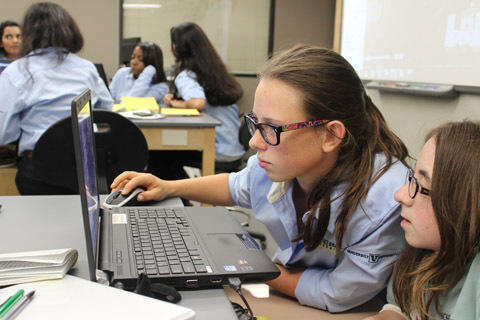 The grant supports a collaboration between SSMV students and Bioimages to develop tools that will facilitate the development of Web-based resources that allow discovery and exploration of the natural world. 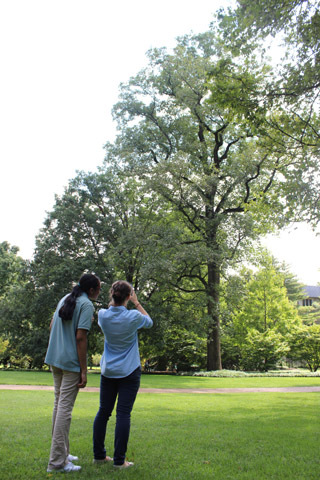 Working in the Vanderbilt Arboretum, SSMV students will test the use of portable devices to collect images and metadata that will be used to archive the images and develop online tree tours of the arboretum. Open source software for image acquisition and management developed as part of the project will be available via the Bioimages GitHub site. 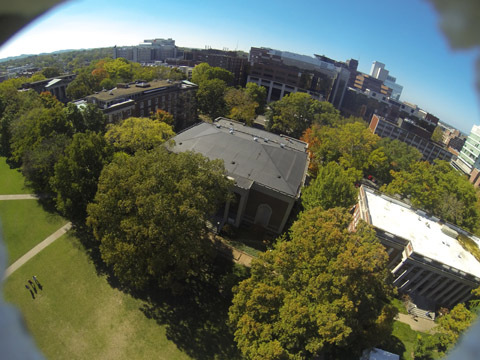 In the fall of 2014, SSMV students used their phones to take various types of images of trees in the historic part of Vanderbilt's campus. The images were assessed for image quality and the kinds of metadata that were recorded with the images. This information helped to determine which types of images can effectively be taken with phones and provided the programmer with information about the variation in the metadata that could be expected to be retreived directly from the photos. Steve Baskauf discussing strategy with SSMV students. 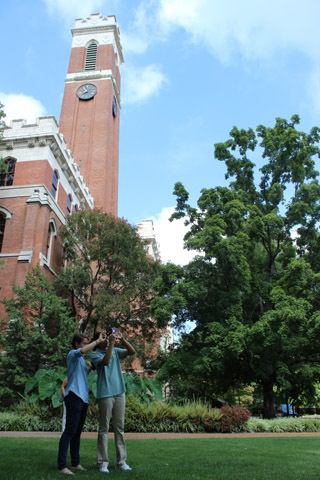 SSMV students photographing the large tulip tree near Kirkland Hall. 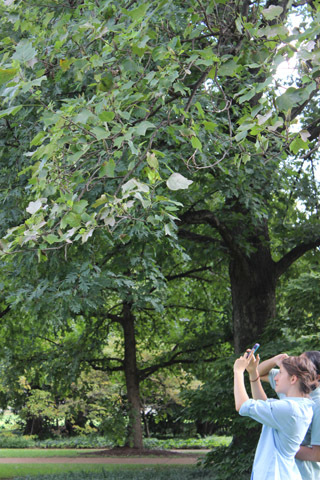 Students taking closer images of leaves. 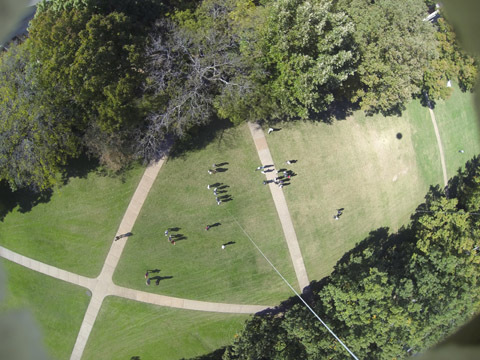 Students experimented with using a remote-controlled camera from a teathered balloon to take aerial photos of trees on the Peabody campus. Click a thumbnail below to view images taken by students and used as part of a tree tour. 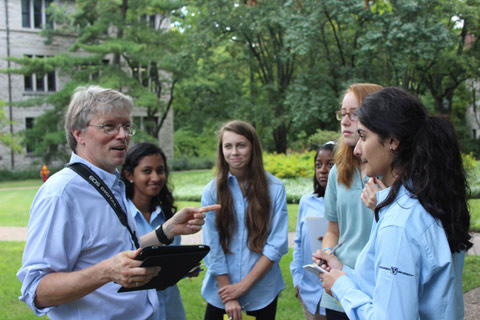 In the fall, students also did research on the trees they photographed by georeferencing old aerial photos of campus and overlaying the GPS coordinates of their trees on the photos. Eventually, the information will be used to construct an online tour of historic trees in the arboretum. Software designer Ken Polzin has developed prototype software that can process images from any source (including phones). 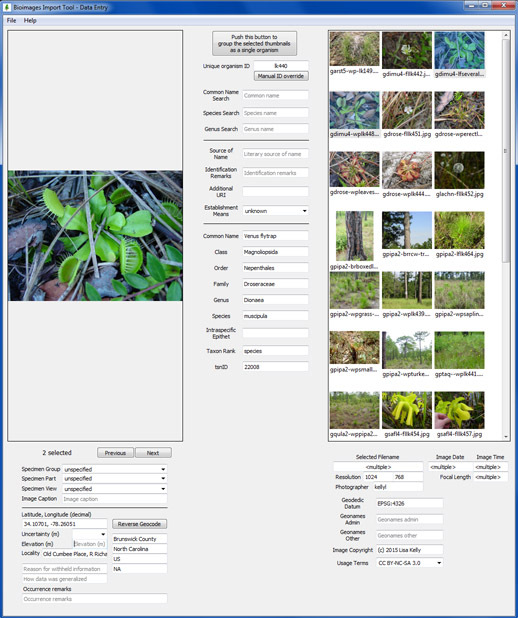 The software links images from the same tree and generates the database used to publish the Biomages website. A video describing how to use the software is at https://www.youtube.com/watch?v=ylK5ok4iRac. 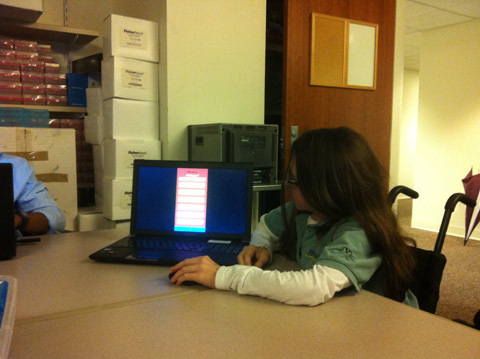 SSMV students are working with Ken to design the user interface for the phone app that will collect image metadata that isn't automatically stored with the photo. 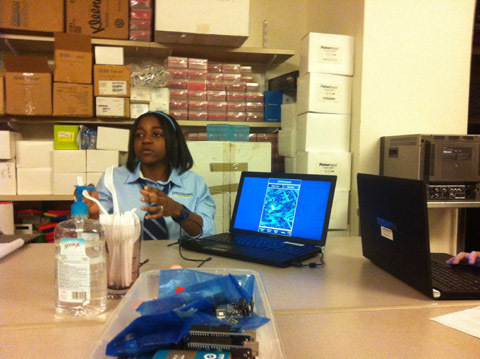 SSMV students presenting their ideas for the app UI. For more information about this project contact Steve Baskauf.